Oh my goodness. What an incredible trip. The first and best thing was that my new relationship flourished throughout. BB is an excellent and intrepid traveler. It took her about 48 hours to learn everything I’ve ever known about traveling and by day three she was taking charge of subway navigation and map-reading. It was impressive and excellent. Especially because while I can always get those things done, I’m never fond of them. We landed in Japan, at Tokyo Narita Airport, on the evening of March 9th. The airport is a million miles from Tokyo. We took the Skyliner in, which is a fast-rail, and then navigated the Subway until we found our hotel in the Ginza district. Ginza (hard “G”), is the glittery shopping district of Tokyo. Central, shiny. But our hotel was not too expensive and very comfortable. Small room, but perfectly good. We found that to be true everywhere we went. The rooms were smaller than Americans are used to, but perfectly acceptable. 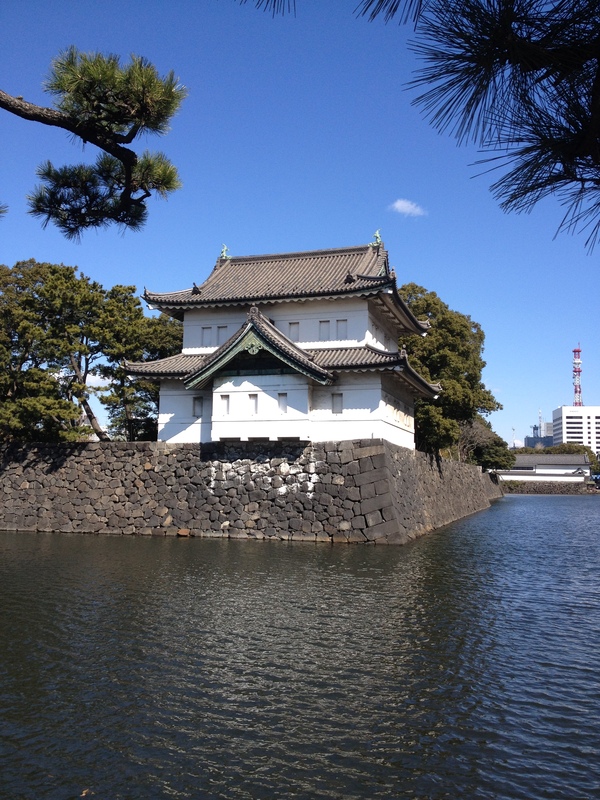 We spent two days in Tokyo, and saw a couple of truly amazing sights. 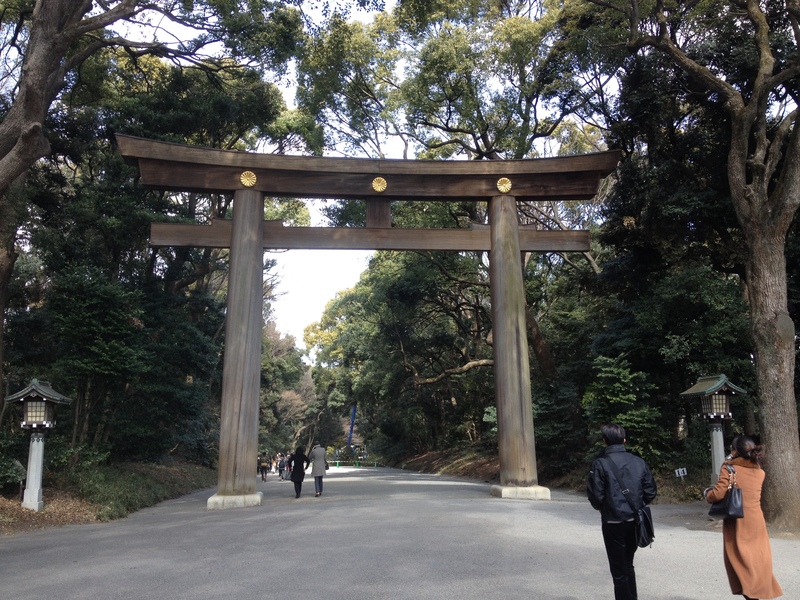 Especially the Shinto shrine Meiji-Jingu, and the Palace grounds. After Tokyo, we took the Shinkansen (Bullet Train) to Kyoto, from which Mt. 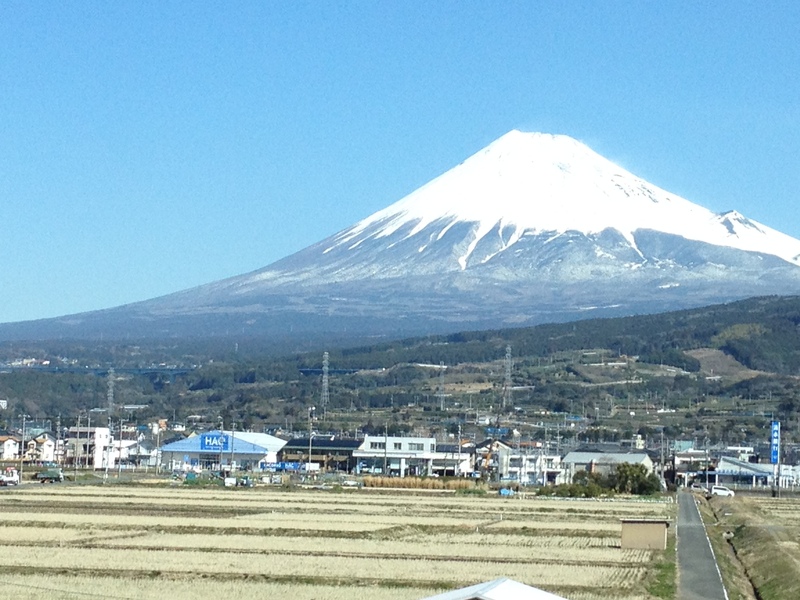 Fuji towered over the lowlands. The amazing thing was how little of the trip was farmland or countryside. For the most part, the trip from Tokyo to Kyoto, about 3 hours on a train that went 200 mph, was solid city. The first plum blossoms were just starting to bud. I bet right now, all of Kyoto is on fire with pink and vermillion. We missed the great flowers, but we also missed the crowds. We had most of the places we went to ourselves, which is one reason I love to travel off-peak season. It was cold, and occasionally wet. 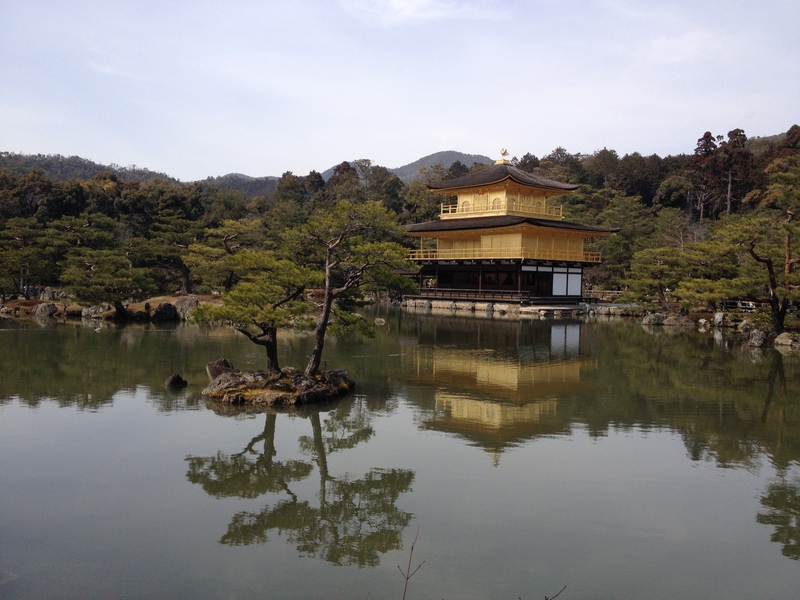 My favorite sights in Kyoto were the Golden Pavilion and the Bamboo Groves. 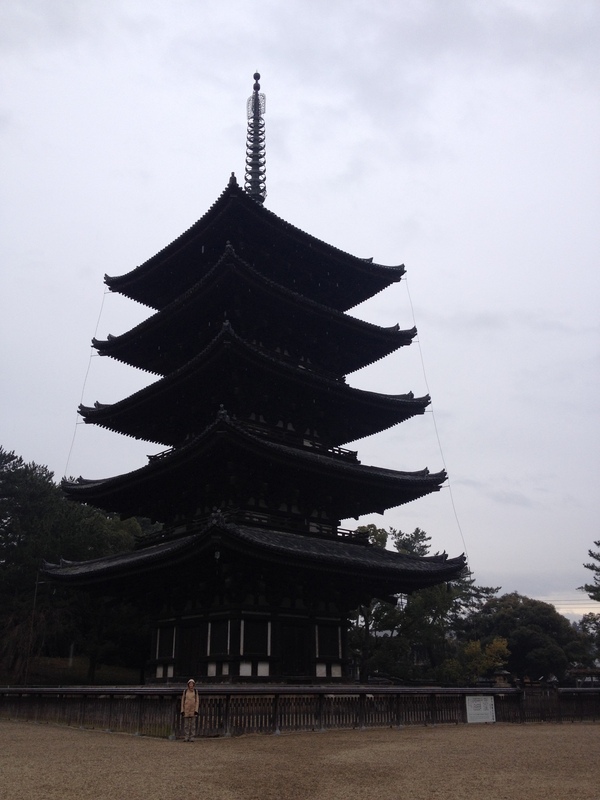 But we had no problem finding places to stay, and we got to see things like this 150 meter five-tiered pagoda, in Nara, alone. Nara, a small city near Kyoto, is the original capital of Japan, before Kyoto, which was before Tokyo. It has some of the most amazing Buddhist temples I’ve ever seen. Including this one, Todai-ji. I can’t begin to describe the sheer size of this. The Buddha inside is five stories high. 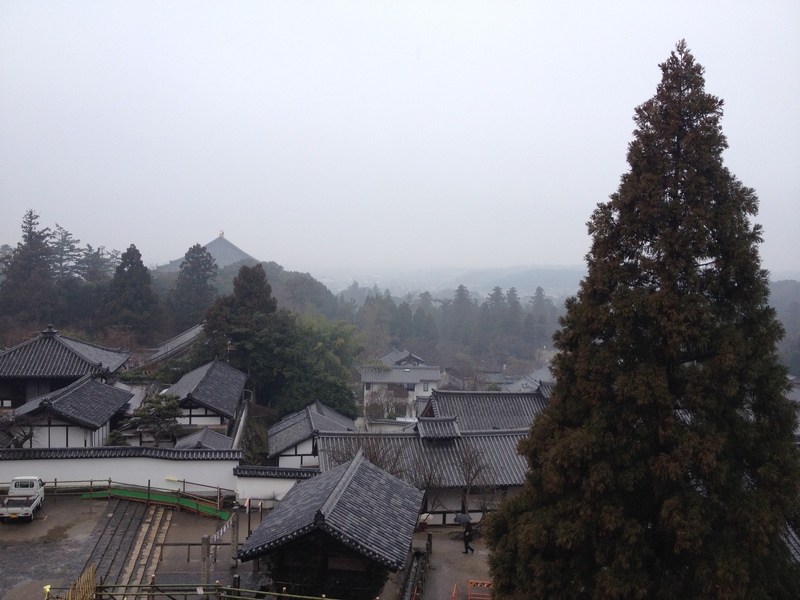 The day we visited Nara was grey and rainy, but the scenery was astonishing regardless. 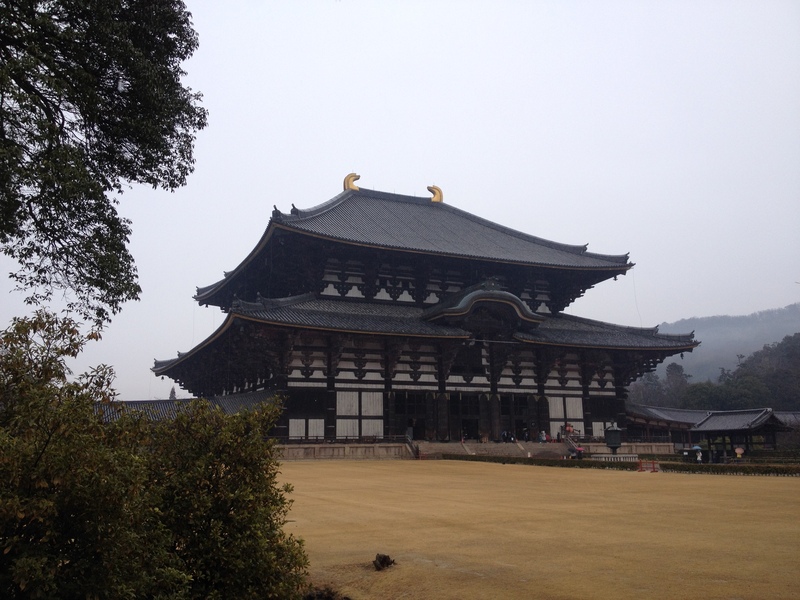 In Nara, we also saw the “Ceaseless Ritual“. A fire-ceremony that has been going on, uninterrupted, for two weeks every year in March, since 752. I didn’t get pictures, because it was pouring freezing rain, but you can find them easily by clicking the link, or doing an image search for “Omizutori“. 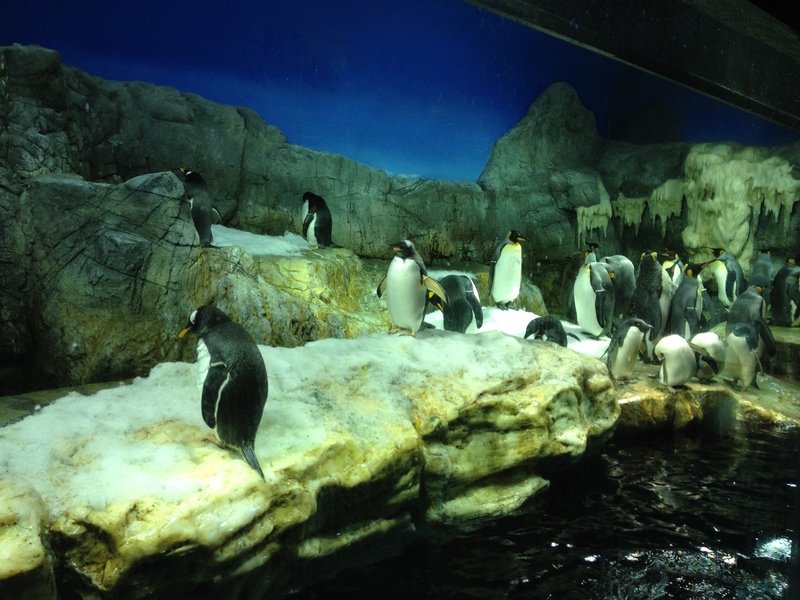 Next we went to Osaka, where we saw the aquarium! It’s one of the world’s great aquaria, and I’ve seen a few, including Seattle, Georgia, and Sydney. Osaka ranks well among those stellar institutions. In addition to the penguins, there was a tank that was about five stories high with a whale shark and hammerheads and gigantic rays in it, with gorgeous soothing music playing. And that, dear friends, was Japan. In Tokyo, in Rippongo, we even ate at the restaurant that inspired the big fight scene in Kill Bill, which was at least three steps past awesome. And I almost certainly didn’t eat the critically endangered bluefin tuna sashimi. Almost certainly. After Japan, we hopped on a plane and flew to Incheon International Airport in South Korea. For an entirely different experience. Which I’ll describe tomorrow. How wonderful! I’m so jealous I could spit. 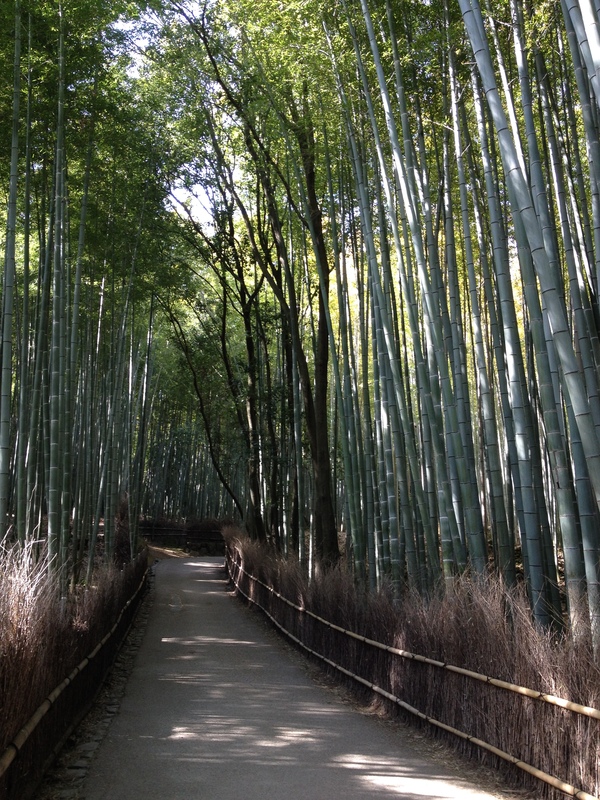 I love that bamboo forest and the walkway. The endless extent of urban landscape is not a good thing for me. I need more green spaces. Glad that you had a great time. And that BB is a good navigator.